STNMS is educational partner with Tata Class Edge. 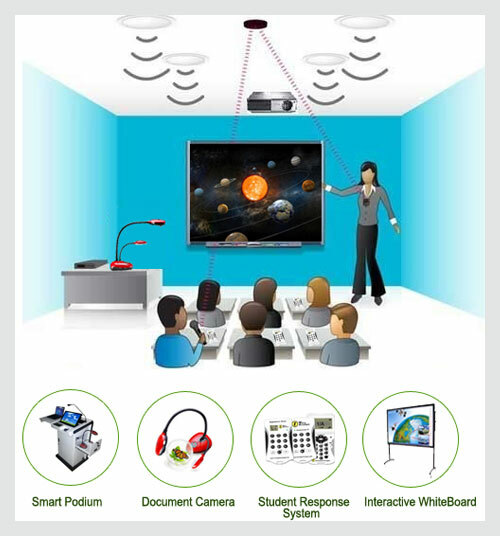 We are created three smart class rooms also called AV labs (Audio-Video Labs).Every lab has one client which is connected to server in knowledge center on which educational data of all classes ( 1st to 10th Classes) stored centrally. This server is connected with main server of Tata Class Edge Server .Every weak automatic synchronization of data takes place from this main server & old data on school server is update with latest data on main server of Tata Class Edge. All the three clients in smart class room access the updated data from the server in knowledge center with the help of Login id and Password which is allocated to each teacher.